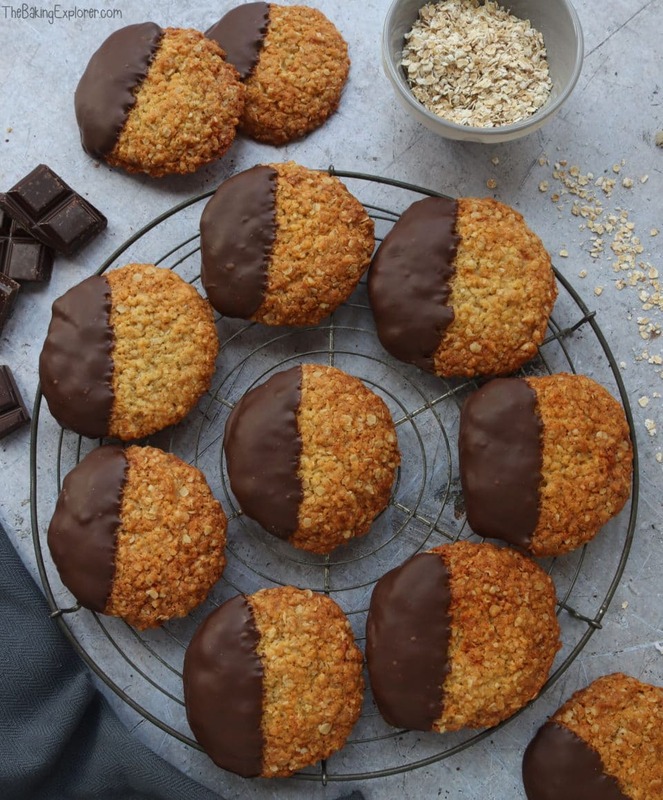 ANZAC Biscuits were made by the wives and family of the Australian and New Zealand Army Corps, and sent to them as the ingredients meant they kept well in transit and didn’t go off for a while. I spent a few months in Australia in 2010 and saw references to ANZAC everywhere, but I never actually tried the biscuits. 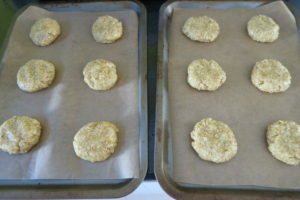 They’re a delicious oaty biscuit made with oats, coconut and golden syrup. After baking they’re crispy on the outside and soft in the middle, and incredibly moreish! This version is dipped in chocolate for extra indulgence. I was sent this recipe by a friend when he was living in New Zealand and woking at a cafe called Vudu (check out their website here). They make some stunning baked goods! If you ever happen to go to Queenstown I highly recommend it! 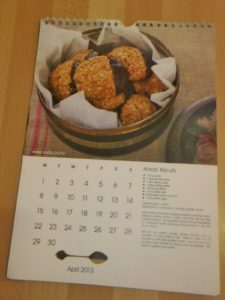 He sent me their 2013 calendar which is full of gorgeous recipes and pictures. I think’s it’s great that they share their recipes with their customers. 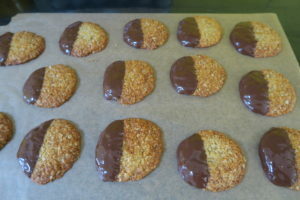 It includes the recipe for ANZAC biscuits which I used. 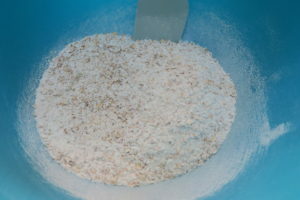 In a bowl I weighed out plain flour, porridge oats, desiccated coconut and caster sugar. And I mixed it together. 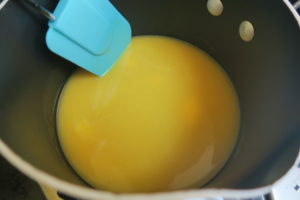 In a pan I melted butter and golden syrup. Once it melted, I poured in the bicarbonate of soda that I had dissolved in boiling water. 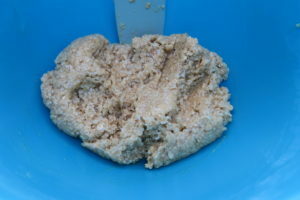 I poured the dry ingredients into the melted butter and mixed it all together well. I used a spoon to scoop out some of the mixture and placed it onto a baking tray, shaped it and flattened it down a little. They baked for 12 minutes until they were golden brown. I let them cool on the tray for a few minutes, then moved them to a cooling rack. To decorate, I melted dark chocolate (you can use milk or white instead if you like) and dipped the biscuits in about a third of the way. Then I put them on some baking paper and left the chocolate to set. 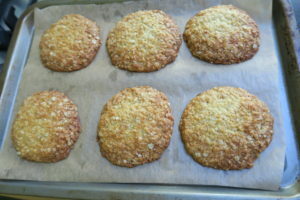 And the ANZAC Biscuits were ready! 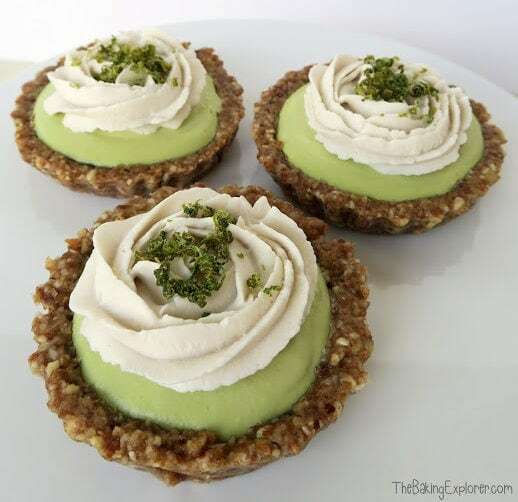 They were really delicious, such a simple and quick recipe to make, with a really yummy result! They’re also great for care packages as they last for several weeks in an airtight container. Thank you! I hope so too, but he would never admit it hehe.